The canning has begun. Spent a small fortune on equipment (e.g., jars, jar lifter, etc.) and additional supplies (e.g., apples, spices, malt vinegar) to get started. 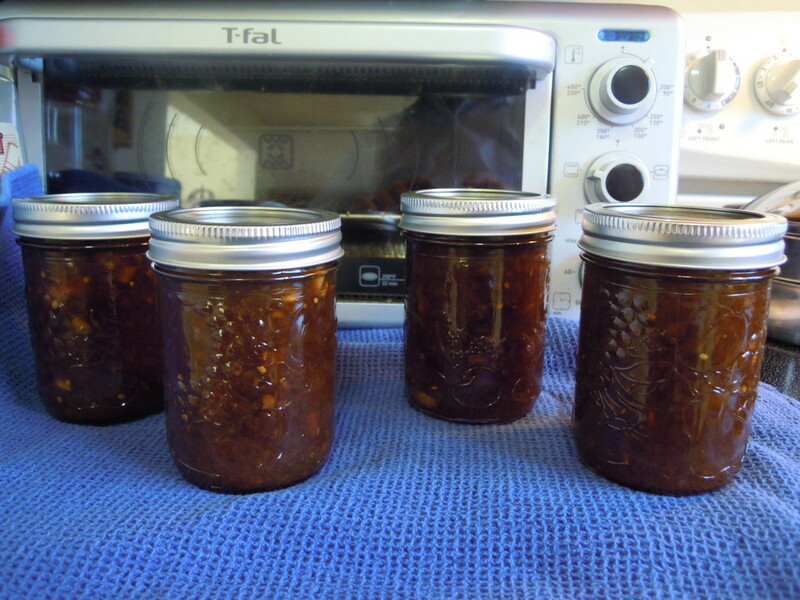 I made my first batch following a recipe for "Green Tomato Chutney - Traditional English Recipe". So I laboured over a hot stove for hours to end up with a grand total (don't laugh ) of four 250 ml jars of chutney. And by the way, this recipe used up only two of my large green tomatoes . Perhaps the most satisfying thing was hearing the lids ping as the jars cooled down. The proof of course will be in the tasting in about a month from now (apparently the taste improves over a few weeks). 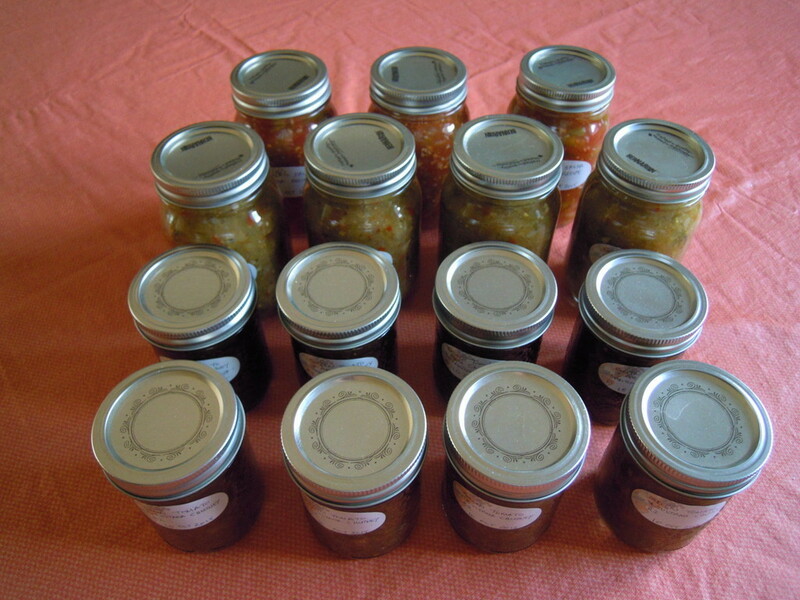 Next will be another green tomato chutney recipe and a salsa recipe. I may try pickling some green tomatoes as well. Nice use of the "leftovers" of summer, trolley. It's cool you're experimenting with multiple recipes. I just cook all mine up at once to get the whole darn process over with. So you have joined the canning club, TD. That was quick. I only joined myself this year and looking forward to eating some of my work. Kelejan ... Yes I'm in the club. So far it's been fun. Not sure if anyone will be able to or will want to eat what I make! But if you have only one life to live you may as well live it as an SFG Canner. @sanderson wrote: What would you put this on? Great question. I think it might go with ham or pork. Chutney is especially commonly eaten with pork. But it is very good with chicken too. 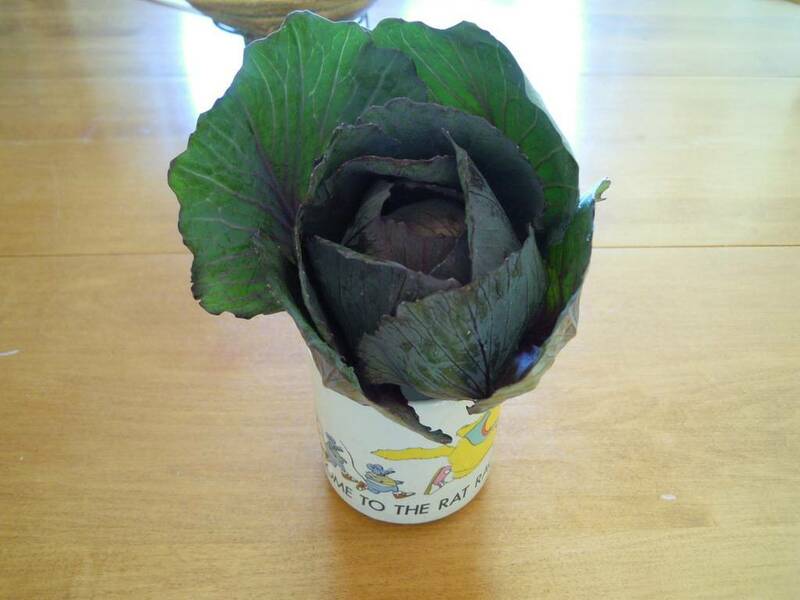 I would even consider putting it in something like a cabbage roll or in a taco or many kinds of hamburger dishes. My mother has eaten it in straight chutney sandwiches, but she went a little berserk for it. She was eating it by the bowlful at one point. She also had it in a cheese sandwich, which sounds a little less goofy. I bet someone from India could tell us a lot more about how to use it, but I don't know that we have many here. Here is the final outcome from my canning experiment ... 4 jars of chutney with green tomatoes and apple, 4 jars of chutney with green tomatoes and sultanas, 4 jars of green tomato salsa and 3 jars of red tomato salsa. That's it for canning for this year. I now have some ideas of what I need to grow next year that will contribute things for canning. Well done!!! Have your fears been alleviated? CC ... Yup I'm good with it. I checked the lids to make sure they are concave. I followed the recipes ... in particular I used the USDA recipes for the salsas. "In the United States, an average of 145 cases are reported each year. Of these, approximately 15% are foodborne, 65% are infant botulism, and 20% are wound. Adult intestinal colonization and iatrogenic botulism also occur, but rarely. Outbreaks of foodborne botulism involving two or more persons occur most years and are usually caused by home-canned foods." There are something like 123 million households (2014 statistics) in the USA and if 20% do canning that's 25 million households. Based on the CDC statistics there were a grand total of 22 individuals who got foodborne botulism. So if my calculations are correct then the chances of getting botulism are very low. I am assuming the statistics are similar here in Canada. Health Canada says one of the things that causes botulism is "improperly prepared home-canned, low-acid foods (for example, corn, green beans, peas, asparagus, beets, mushrooms, spaghetti sauce, salmon) ..."
My canning involves tomatoes (acid), lemon juice (acid) and vinegar (acid). So I think all is good! TD, Please post that beautiful photo and write up to 2 recent canning topics. http://squarefoot.forumotion.com/t16995p32-first-serious-canning-session?highlight=canning and the one about 2015 pressure canning cook off. I assume you did not want me to copy the post about fears of botulism. We got a few snow flakes coming down this morning! Did a cleanup on my two SFG boxes today. Here is a photo before the cleanup. 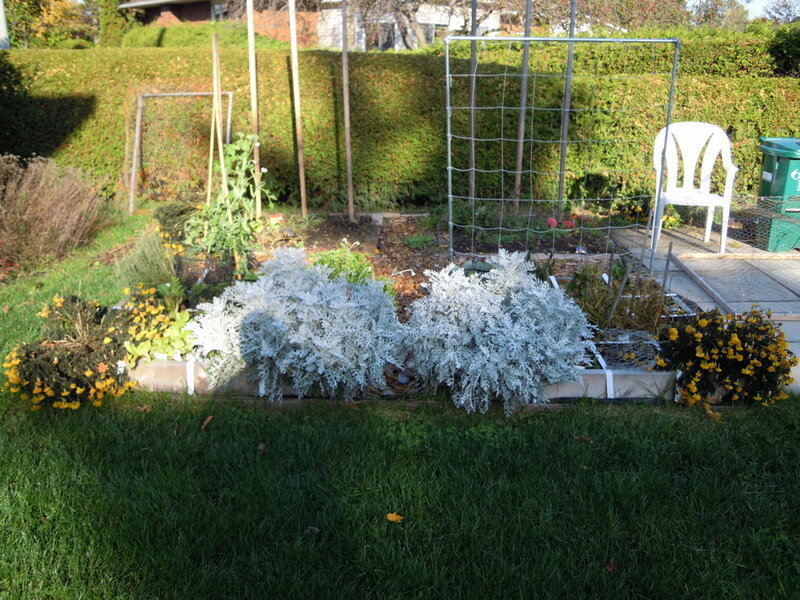 The Dusty Miller and Marigolds really took over the front corner squares and overflowed. Something else that got out of hand a bit was the parsley. This photo was taken around mid morning. The low angle of the sun at this time of the year means that the house and garden shed cast shadows on the SFG. I'll take a post cleanup shot later. So, would you recommend planting four marigolds per square next year. I am thinking about only planting one per square this coming year. This past year I planted a few squares with two per square and I still felt like they would have done better at one per square. Of course it may have to do with our long growing season. At the end of this month it will be 7 months in the ground (planted from transplants in April and still growing). Planting a maximum of two marigolds (or dusty miller) per square next year but after what you said perhaps one is enough. Planting one marigold and one dusty miller together in each front corner square. Planting a different flowering plant where I currently have the dusty miller. Planting one marigold in the centre of a square and planting something like green onions around it in the same square? The onions would be harvested before the marigold got too big. Lot's to think about over the winter. 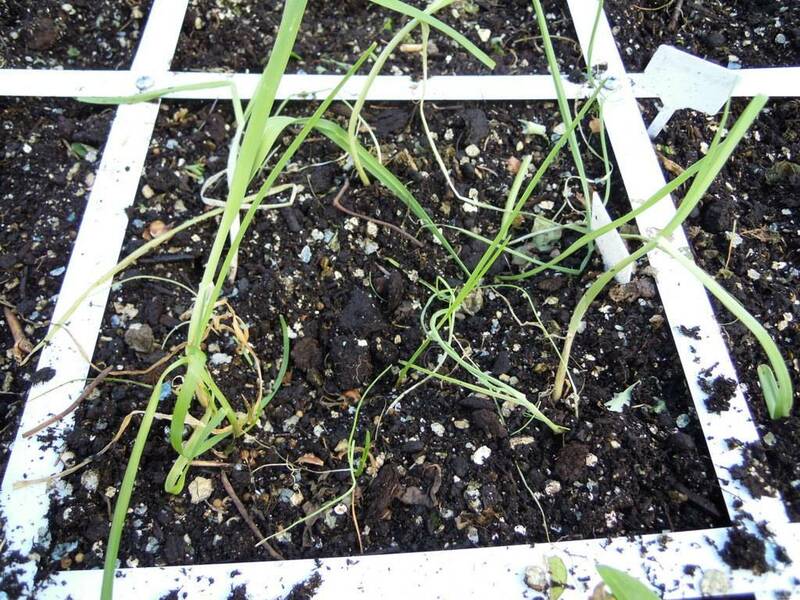 Your last choice of planting green onions with one marigold sounds like a good plan. It did take a long time before the marigold filled out the square. 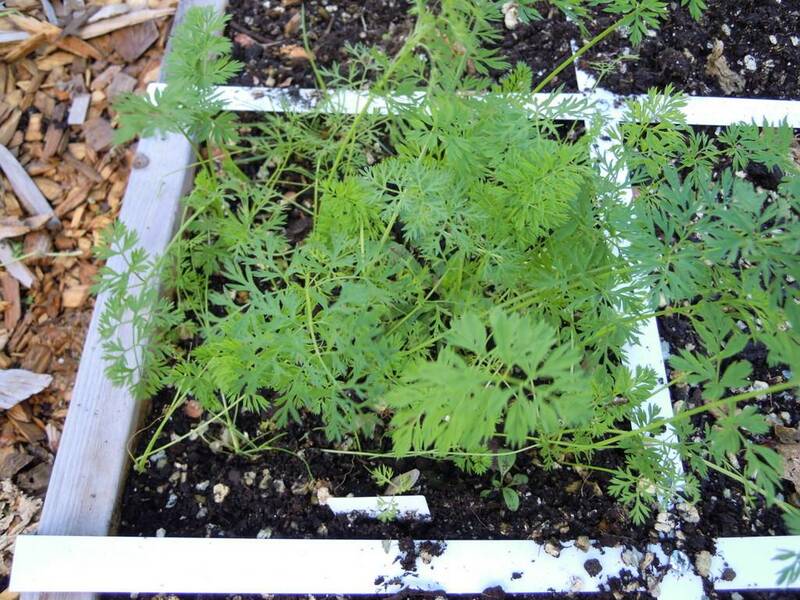 Another alternative is to cut back the marigold sometime during the season. Mine got so big they started leaning over (and sometimes breaking the branches) and hanging in the aisles or into adjacent squares. Doing a little more work on the SFG boxes today. There are still a few squares that are occupied as seen in the photos below. 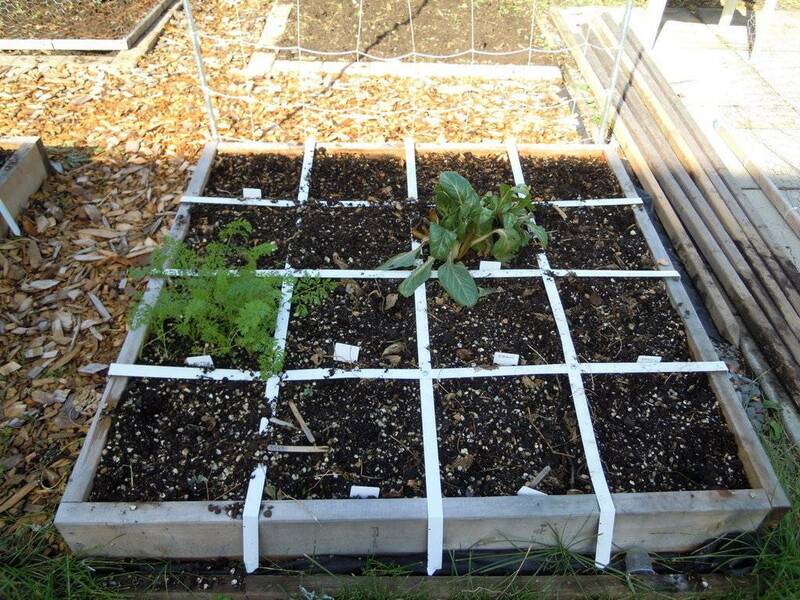 I'll be adding compost to the squares and planting tulip bulbs and garlic cloves. Those carrots are still just babies. They wouldn't be expected to have much going on below ground. 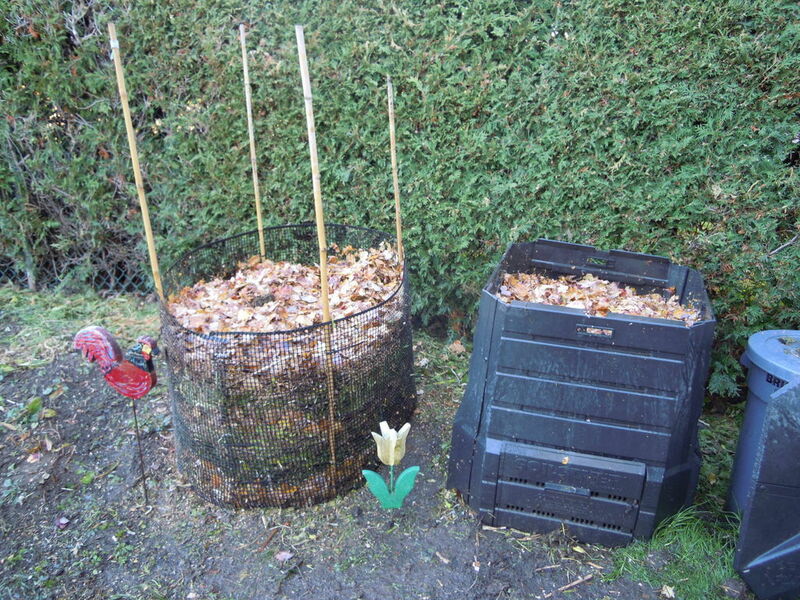 Inspired by the recent posts on the "To compost or not to compost ..." thread, I decided to compost. I don't expect much will happen during our cold Ottawa winter but here is what I did. 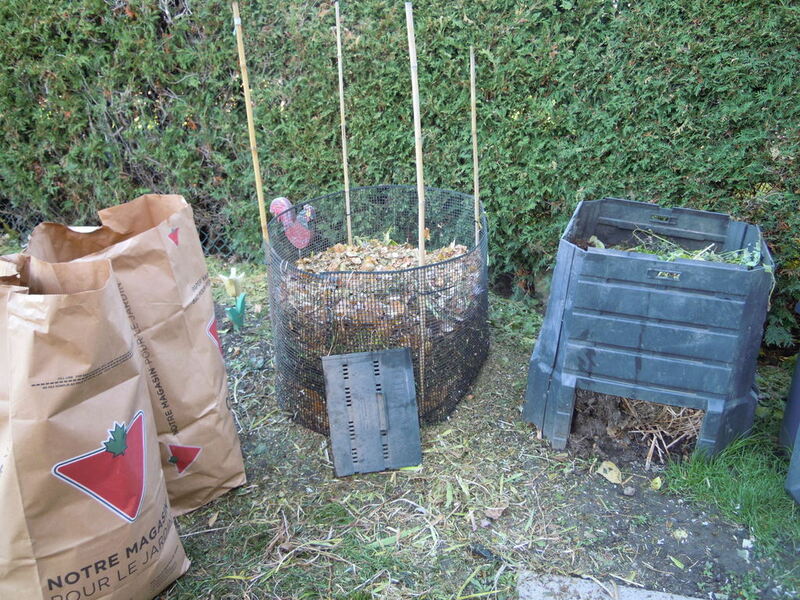 I already had a commercially made plastic composter that has served me well for several years when I have used it. 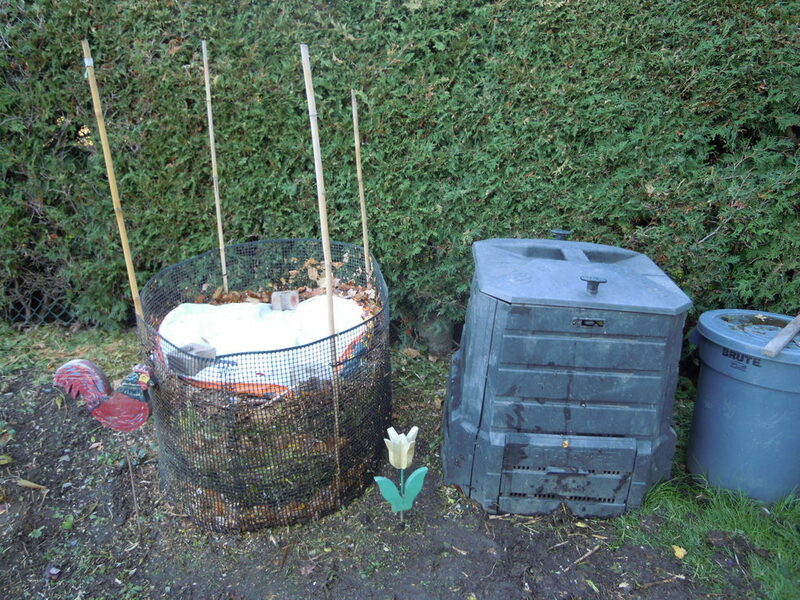 Today I expanded the composting operation by adding another composting "bin" made out of plastic hardware cloth tie-wrapped to bamboo stakes. After filling it I covered the top with a plastic kiddie size blow-up swimming pool. I may need to do something better because water will pool on top of it. Perhaps I can drape a small tarp over the top of the stakes which would need to be made shorter. I also collected more leaves from the neighbour's property and took Kelejan's advice and choped them up with the lawnmower. 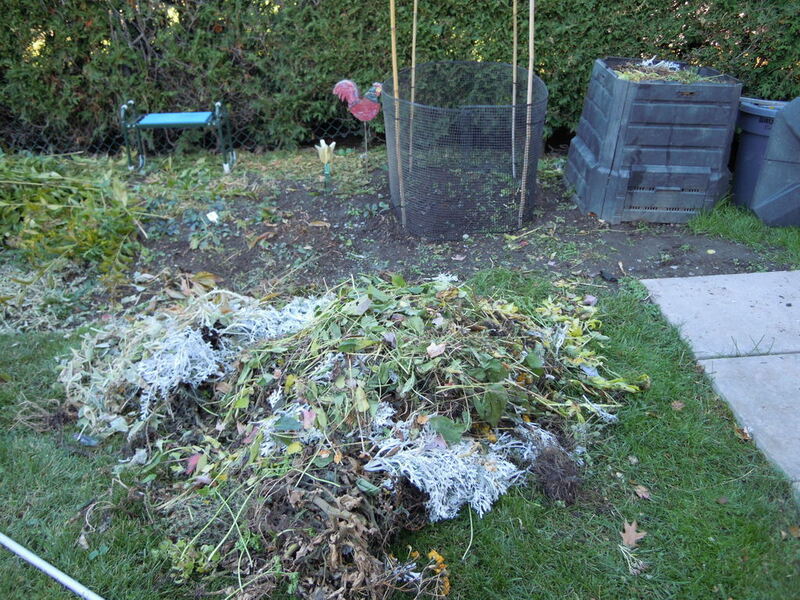 I then chopped up the material from the flower beds and veggie gardens with the lawnmower. I'm not sure that was the right thing to do but I figured it's all an experiment anyway so why not. The photos show the progression. Today (October 27, 2015) I harvested the last of the lettuce, carrots (mostly tops) and spinach. I could not harvest the swiss chard because it looked frost damaged. 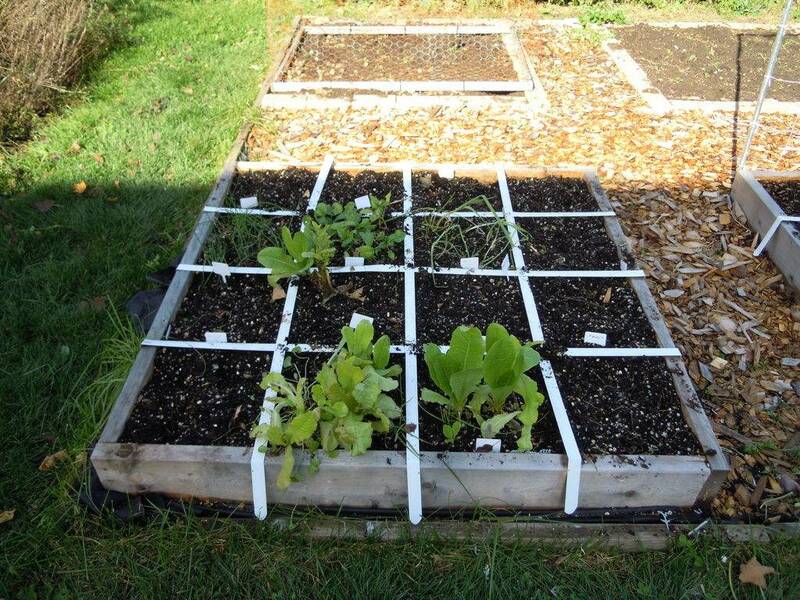 I then cleaned out those squares and added compost to them. 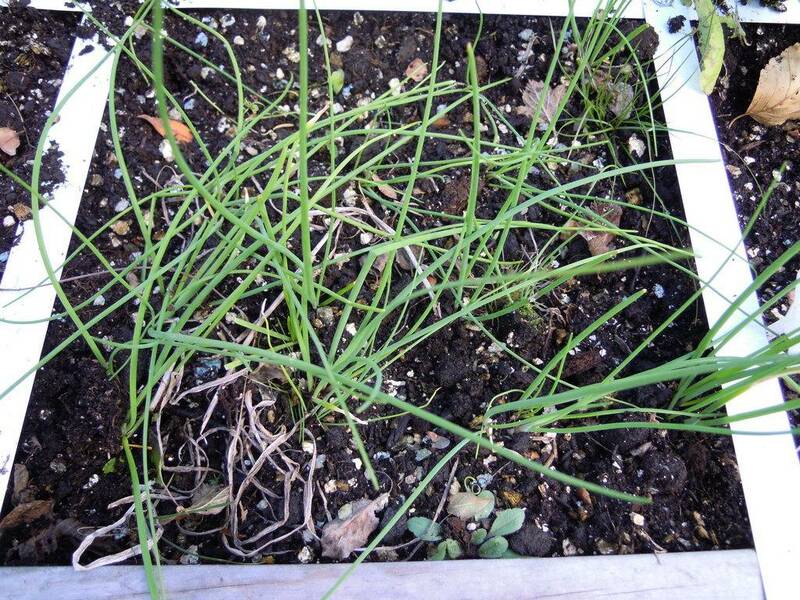 I will leave the chives and leeks to winter over. I planted a total of 36 tulip bulbs in the front corner squares of the two boxes. I also planted two squares (total of 18 cloves) of garlic. 12 of the cloves came from purpose bought garlic from a local garden centre. Since I ran out of cloves I took some cloves from garlic bought at the grocery store. The latter may not grow but it's worth a try. I'm leaving the cages in place to stop the squirrels from getting to the bulbs. Just need to cover the MM in the boxes with leaves and that will be it for this first year with SFG. I may do a lessons learned that I will post on this thread. BTW the new compost pile is already heating up in the centre. I'm not sure it is worth a try. 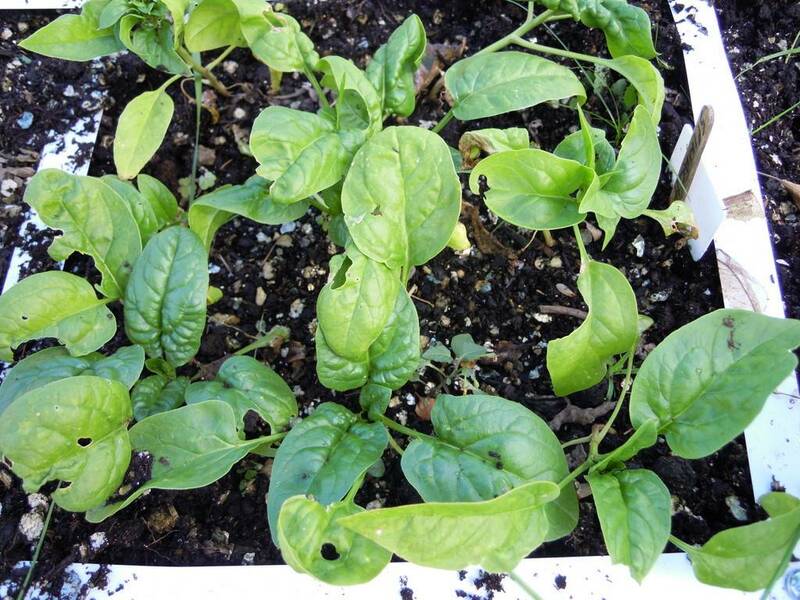 They may be harboring diseases that can infect the rest of your crop. And they may be disease-resistant and not even show anything suspicious looking. I understand that the long-time garlic capitol of America doesn't even grow garlic anymore because of serious disease problems. The garlic and onion seeds and bulbs and cloves you get from the professionals are generally checked for diseases first. 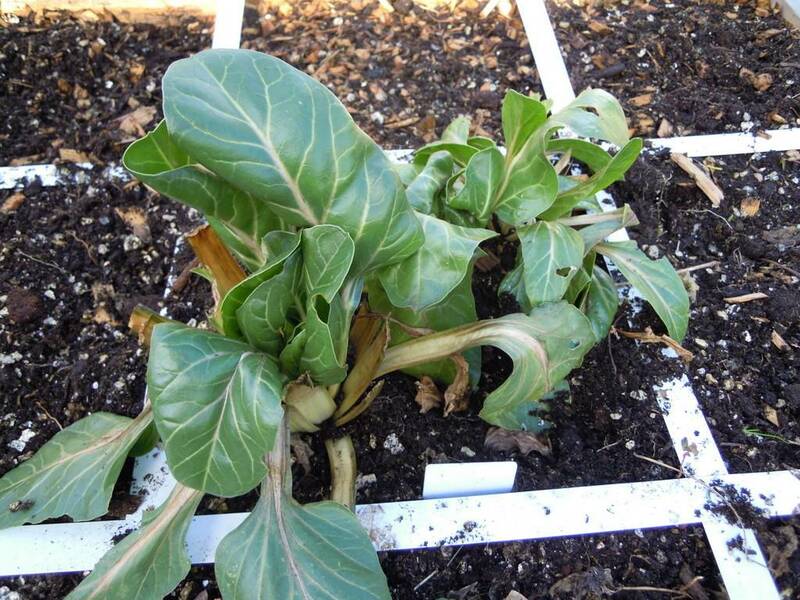 Yes, as I posted in N&C Midwest, all I have left in my SFG is Swiss chard. All tucked in!